Coming off an unexpected defeat at the West Hollywood/Beverly Hills Democratic Club endorsement meeting last week, Butler continued her losing streak on Sunday when Santa Monica Mayor Richard Bloom successfully prevented her from winning the coveted Santa Monica for Renters Rights (SMRR) endorsement. As with the WeHo/Beverly Hills Club endorsement, Butler was widely expected to easily walk away with a win. 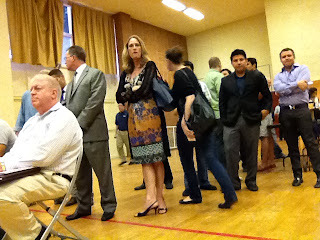 During the AD50 primary, Bloom snubbed SMRR's endorsement meeting, claiming irregularities and lack of transparency in the endorsement process. 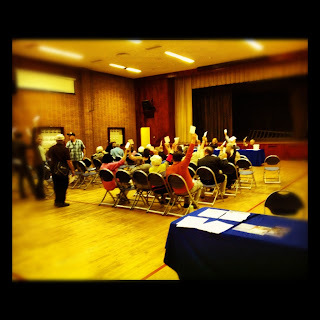 SMRR voted to overwhelmingly to endorse Torie Osborn in the primary. Bloom's actions during the primary rankled the board's membership, creating a rift Bloom would have to work hard to overcome in the general election. Butler for her part was aided on Sunday by SMRR co-founder Dennis Zane, who helped the Assemblywoman work the packed room. Bloom's campaign circulated a May 3rd letter from SMRR co-chairs Patricia Hoffman and Richard Tahvildaran-Jesswein condemning Butler for touting an endorsement from the Apartment Association of Greater Los Angeles (AAGLA), powerful rent control opponents who characterizes rent stabilization measures as "socialized housing", and laments it was unable to stop this "disease" from spreading throughout the state in the 1970's. "We and our many members in Santa Monica were dismayed to receive your announcement of your recent endorsement by the Apartment Association of Greater Los Angeles in your quest for election to the California State Assembly," wrote Hoffman. "This endorsement and your apparent enthusiasm for it will certainly sow doubt and mistrust for your candidacy among the renter voters of Santa Monica, West Hollywood, and West Los Angeles." In the end, SMRR's membership remained ambivalent and divided. Butler wasn't able to reach the 55% threshold needed to secure an endorsement. "I just couldn't vote for someone who was proud of AAGLA's support," said one SMRR member who asked his name not be used. "If we endorsed Butler too, what does that say about us?" On Monday night, Butler came dangerously close to losing the endorsement of the Stonewall Democratic club, but the vote was called off at the last minute and rescheduled when irregularities were discovered in the membership list. Recent developments raise some interesting issues for the candidate. During the AD50 primary, Butler explained away her endorsement loses to Torie Osborn by claiming her opponent had unfairly packed clubs with paid memberships. But twin losses and a near miss for Butler in less than a week seems to have changed that narrative. But thanks to Prang's motion to table the vote, Butler will get a third shot at the club's endorsement in August. 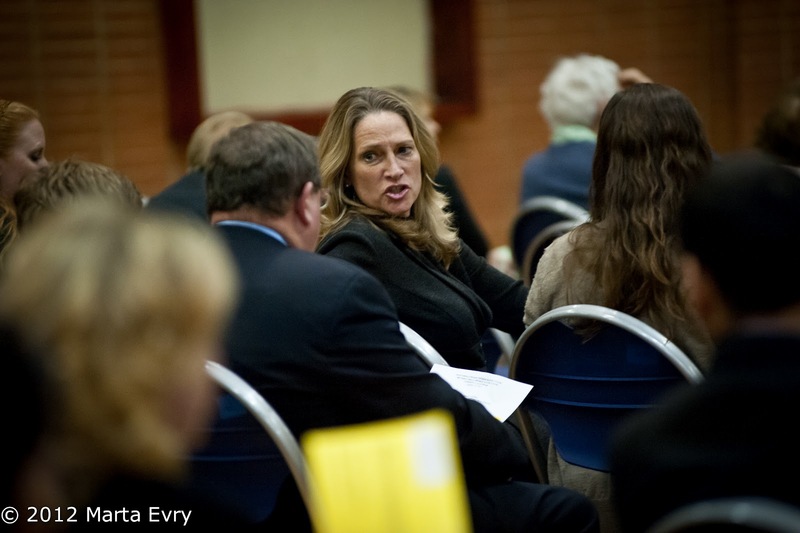 In a surprise upset, Betsy Butler lost her bid tonight for the West Hollywood/Beverly Hills Democratic Club endorsement for the 50th Assembly District race. Despite the fact Butler faced virtually no organized opposition and had packed the lightly attended meeting with friends, campaign workers and supporters (including WeHo Mayor Jeffrey Prang and Councilman John Duran), Butler was unable to garner the votes needed. The club membership voted instead not to endorse either Butler or opponent Santa Monica Mayor Richard Bloom. In January, Butler lost the WeHo/Beverly Hills primary endorsement to Torie Osborn 43-28. The endorsement meeting made national news when a video of Butler supporter and former WeHo Mayor John Duran screaming obscenities at Osborn supporters went viral. Remarkably, Butler received only 25 votes at tonight's meeting, 3 less than she did when she lost to Osborn. 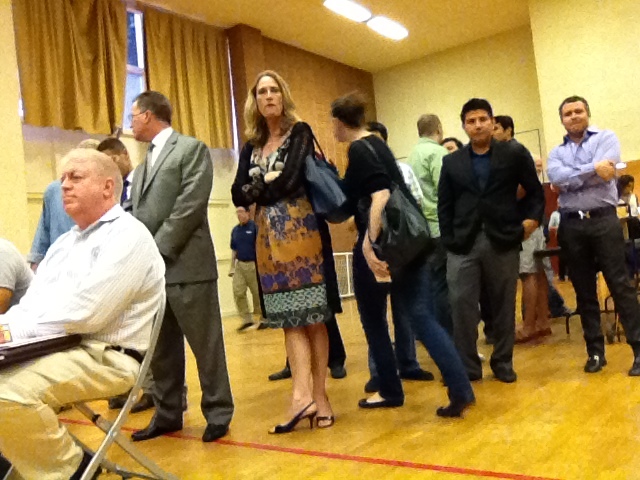 Tonight's WeHo/Beverly Hills endorsement meeting. photo by Brian Adams. After the results were tabulated, Butler and her supporters demanded a do-over of sorts, with Jeffrey Prang putting forward a motion to table the vote and hold a new one at a later date. After much debate, and some attrition of the largely elderly membership, Butler was able to get a new vote scheduled for some time in September. For his part, Bloom seemed pleased with the results, "Tonight's vote is a big victory for my campaign," said Bloom in a written statement. "It underscores the growing support for my candidacy in the 50th Assembly District where I have spent most of my life, and for our vision of progress and prosperity for the State of California." Wherever you stand on the political spectrum - be it ardent Obama supporter or member of the "anyone but Obama" crowd - one thing has to be abundantly clear by now. Whether it's his record at Bain Capital, his secretive off-shore bank accounts, his refusal to release his tax returns, or even his discomfort with hiring undocumented domestic staff - not because it's illegal, but because someone might find out - Mitt Romney is a man entirely comfortable with deception. Romney's shameless flip-flops on everything from abortion to the individual mandate surprises no one, least of all his supporters. But the Bain mess that erupted over the weekend is something else entirely. Behind all the technical talk of SEC filings and "retroactive" resignation, lies the uncomfortable, profound and unshakeable truth that Romney knowingly and purposely built some of his enormous wealth by stripping thousands of Americans of their livelihoods by either shipping those jobs off to Mexico and China like so much scrap metal or by forcing their companies into bankruptcy with debt often leveraged with taxpayer funds. It's something not lost on the Obama campaign. Releasing an ad some equate with Lyndon Johnson's 1964 "Daisy" spot against Barry Goldwater, on Friday they drove the knife in. Against a backdrop of Romney singing "America The Beautiful", the ad features the ex-governor's record of shipping jobs overseas and his tax-haven accounts in Switzerland and the Cayman Islands. 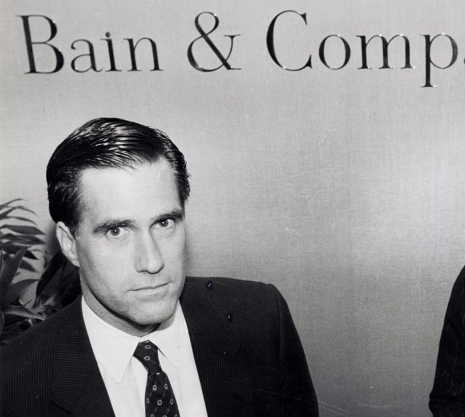 The ad sent the Romney campaign scrambling. Unable to refute the accuracy of the ad, Romney instead resorted to boilerplate hyperbole, demanding an apology from the Obama campaign for creating an "insult to America." "Is this the level the Obama campaign is willing to stoop to? "complained the normally reclusive Romney on CNN. "Is this up to the standards expected of the President of the United States?" The Obama campaign issued no apology, instead twisting the knife even deeper with a follow up ad openly mocking Romney as a thin-skinned attack dog, "He sure asks for a lot of apologies," the tag line reads, "When he's not busy launching attacks." Romney may be a man entirely comfortable with deception, but what he is not comfortable with is being called out on any of it. Because what's emerged over the last week is a Romney he'd rather the public not see at all - a privileged, spoiled man-child, someone guided by no moral compass whatsoever, entirely at sea, unable to defend himself against the indefensible. "It's called politics," wrote one of my Republican relatives, a reluctant Romney supporter by way of the Anyone but Obama club. "Obama isn't free from his faults either." Actually, I think you can call it any number of things - lying, greed, entitlement, hypocrisy and fraud to name a just few. And sure, Obama has his flaws....... but I'm reasonably certain hiding cash in off-shore tax havens and personally profiting off the misery of his fellow Americans aren't among them. A baby hummingbird defies the odds when it falls out of the nest and lands in blogger Dave Dayen's backyard. Momma bird keeps coming around to feed it and every day it gets a little stronger. It's even trying to fly! A Venice Walkstreets neighbor, Dave Dayen, invited me to come over to take a few pictures. If you find a baby hummingbird out of the nest in your own yard, here's some good advice on what you should do. Some people will see a hummingbird in a nest by him/her self and think that the babies have been abandoned. This is usually not the case. Mom may be sitting in a tree or bush nearby waiting for the place to be "clear" before going to the nest. However, if you think that the nest has truly been abandoned, sit down and watch the nest continuously for a solid hour. Moms usually come to feed the chicks about four to six (4-6) times per hour. She is so fast (about four (4) seconds) if you blink wrong, you might miss her. Baby hummingbirds will usually stay very quite so as not to alert predators to their location. 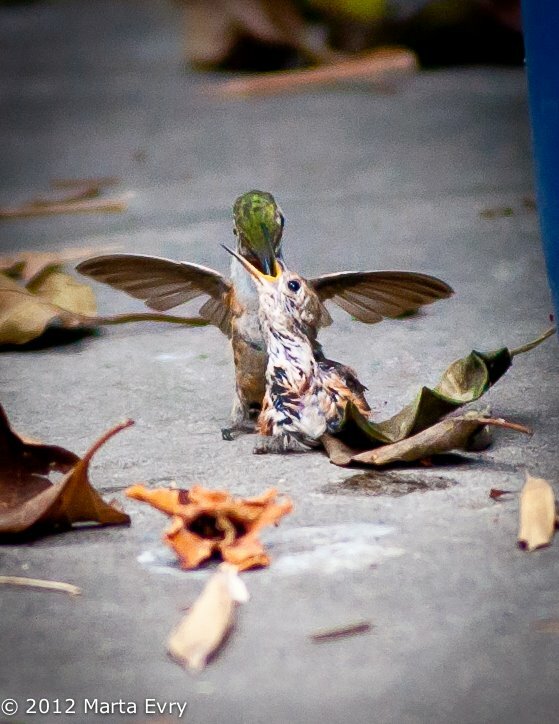 If you hear a baby hummingbird chirp for more than ten (10) full minutes, they are usually starving and need help immediately. I'm sorry to say the little guy didn't make it after all, despite the valiant efforts of my neighbors to keep him safe. Nature is a wonderful and amazing thing, but I'm afraid it can also be quite cruel. So it goes. Capping a dramatic showdown over the most expensive project in state history, California leaders on Friday gave final approval to the controversial high-speed rail project, firing the nation's first bullet train toward construction after an impassioned debate over whether the $69 billion price tag was too big of a gamble for the state's fragile economy. The Democrat-controlled Senate passed the first $8 billion leg of the $69 billion project -- by a single vote, fittingly -- to launch the most expensive public works project any state has undertaken in U.S. history. Following the Assembly's approval on Thursday, there is now nothing left in the path of Gov. Jerry Brown's plan that voters approved four years ago. "Ten, 20, 30 years form now, Californians will be glad that we made the decision and that they have a 21st Century modern transportation system that will be the pride of the country, and the pride of the world," said Senate President Darrell Steinberg, D-Sacramento. The first 130-miles of track will begin construction in the Central Valley next year, laying the backbone for a 520-mile high speed rail system to be completed by 2029. The 3-hour journey between San Francisco to Los Angeles is expected to cost around $85 in today's dollars for one-way ticket. The train would travel up to 220 mph, and would include stops in Millbrae, San Jose, Gilroy and possibly Anaheim. "The things that dreams are made of, California does right,'' said Sen. Juan Vargas (D-San Diego) told the Mercury News. Every member of the CA GOP Senate Caucus voted against funding. They were joined in opposition by 4 Democratic senators - Joe Simitian of Palo Alto, Mark DeSaulnier, of Concord, Alan Lowenthal, of Long Beach, and surprisingly, Fran Pavley, of Agoura Hills. URGENT! Make Two Calls RIGHT NOW And Save Thousands of Califonia Jobs! IN ONE HOUR, the California State Senate is voting on whether or not to follow the lead of Tea Party Republican governors and reject $3.3 billion in federal stimulus for High Speed Rail and the thousands of jobs it would bring. Folks, California is in no position to turn down stimulus, refuse jobs, and reject a badly needed transportation project that would reduce the state's dependence on oil. Jobs: California is still suffering from high unemployment. The high speed rail project will create thousands of jobs in the next few years across the state, good jobs that California families need to help the economy recover. Please do not kill these jobs - please release the high speed rail funds voters already approved. The project is sound: Do not believe the anti-rail people - instead believe the facts. High speed rail systems all over the world cover their costs, including the Acela in the US Northeast. The independent peer review study of the California high speed rail project showed it would cover its operating costs through ridership. Californians want to ride this train, and the demand is there. Please do not kill this project - please release the high speed rail funds voters already approved. The Central Valley is a good place to start: The idea that the Central Valley segment is a "train to nowhere" is a lie. Nobody plans to build track just in the Valley and nobody plans to run trains just in that area alone. It's the starting point of a statewide system, just like the first segments of the interstate freeway system. The current HSR plan includes funding for rail projects in the Bay Area and Southern California, which is going to be helpful. But you can't build HSR between SF and LA without going through the Valley. It's the missing link and the best place to begin. Plus, the Obama Administration has said they will take away our stimulus money if Senators do not release the voter-approved project. HSR is necessary for the environment: High speed rail is a key piece of California's environmental efforts. The California Air Resources Board declared it essential to meeting the AB 32 carbon reduction goals. Motor vehicles are responsible for 57% of the pollution in the Central Valley and a key cause of asthma in Valley children. If the legislature kills high speed rail now, it would saying that California is not serious about addressing climate change or improving public health. HSR is good for the state budget: The argument that infrastructure stimulus is bad for the budget is a right-wing talking point. HSR funds will create desperately needed jobs that in turn contribute new tax revenues to the state. Further, the interest payments will come from truck fees, not from schools or health care. Legislators voted for bond funding to build bridges and dams in the depths of the Great Depression and it did not hurt schools or other public services. We should follow that proven path. Feel free to add your own points, but keep it friendly and civil. We can win this fight, but only if we get active now.